Chemical lobbyists are reportedly “satisfied” with and “optimistic” over the Environmental Protection Agency’s new rules for implementation of the nation’s primary chemical safety law. These days the chemical industry has good reason to be in high spirits. With Scott Pruitt at the helm, President Trump’s EPA has been a boon for the industry. The Trump administration has spent its first six months appointing people with deep industry ties to critical energy and environment positions. Last week Trump announced his intention to nominate Michael Dourson to head the agency’s office of chemicals and pesticides. Dourson has a troubling history of working with industry to undercut chemical regulations. If the Senate rubber-stamps the nomination, he’ll be working with Nancy Beck, a former American Chemistry Council bigwig. We called Beck “the scariest Trump appointee you’ve never heard of” – at least unless Dourson is confirmed. The chemical industry is finding sympathetic ears inside the EPA, especially when it comes to implementing the revised Toxic Substances Control Act, or TSCA, which was significantly overhauled last year. Particularly important are two rules dictating how the EPA will select and evaluate chemicals for safety. The rules were proposed in January, shortly before Trump took office, and were met mostly with praise from public health and environmental advocates. But the American Chemistry Council, or ACC, the industry’s largest trade association, filed comments largely in opposition. The final rules, published last week in the Federal Register, have many significant pro-industry changes. Below are some that have the biggest implications for chemical safety. In response to the ACC and other chemical industry comments, the EPA gave itself discretion to exclude important sources of chemical exposure from safety assessments. This is important because people are exposed to chemicals in myriad ways. Everyone gets some chemical exposures from consumer products, food, dust, drinking water and air pollution, but some people have unique exposure risks – such as workers who manufacture and process chemicals. Some chemical uses have largely been phased out, but people remain exposed through so-called legacy uses. Often, people are exposed to the same or similar chemicals from multiple sources. The law instructs the EPA to consider all these different sources of exposure and also the different populations likely affected when determining a chemical’s safety. The ACC didn’t like this approach. In its comments, the ACC said looking at all those sources of exposure would “lead to an absurd result.” The ACC also included a laundry list of uses it wanted to be excluded from most risk evaluations. These included so-called non-TSCA chemical uses regulated under other laws or through other agencies, worker exposures regulated by the Occupational Safety and Health Administration, and low exposure uses. When the EPA published its final rule, it reversed course, stating that after reevaluating the proposal it would allow risk evaluations to be conducted looking at only a subset of uses and exposures. As recommended by the ACC, the EPA also decided it had discretion to exclude certain uses regulated by other agencies, intentional misuses and low exposure uses. Most jarringly, the final rule generally excludes legacy uses and disposal of chemicals that are no longer on the market. This is a significant problem because uses are often phased out after they are identified as dangerous, but chemicals can stay in the environment for generations. 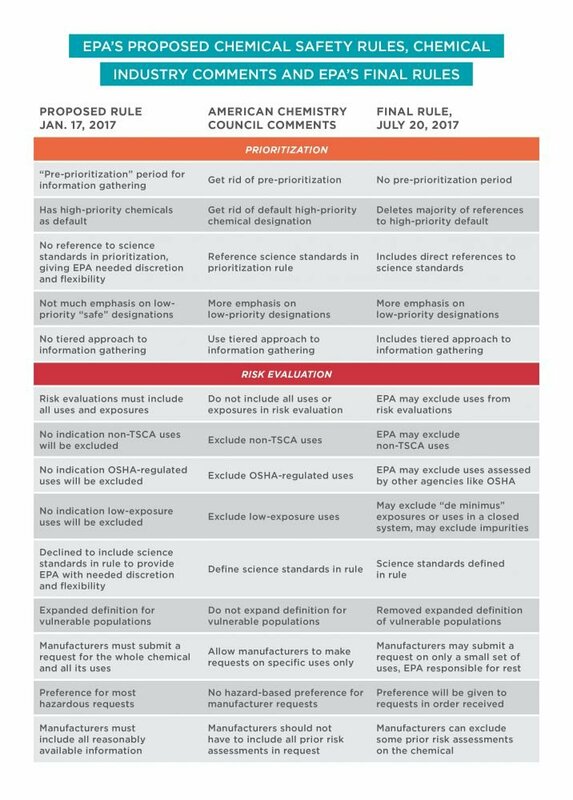 The new TSCA requires that EPA designate chemicals as either low or high priority. “Low priority” is a de facto safety designation. High priority chemicals, on the other hand, might pose risks to public health or the environment, and the EPA must evaluate their safety. Because low priority chemicals won’t undergo rigorous analysis or be regulated, the law sets a high bar. A chemical will only be designated as low priority if there is enough information to feel confident it is safe. Because this should rightly be a tough standard to meet, the EPA explained in the proposed rule that most chemicals would be considered high priority by default. The new law allows the industry to request that the EPA assess particular chemicals. The law gives the EPA significant discretion as to how it will receive these requests and how it will decide whether to accept them. In the rule as proposed in January, the EPA reasonably included a requirement that the requestor provide the agency with all information it would need to complete a rigorous and thorough safety evaluation. That would include information about all different uses and likely exposures. The EPA reserved the discretion to reject a request if the requestor did not provide enough information. The EPA also proposed to give preference to manufacturer requests with evidence of high risk. The ACC really didn’t like this approach. It said the EPA’s proposed information requirements would “make it extraordinarily difficult, if not impossible, for a manufacturer to submit a request acceptable to EPA.” The ACC said manufacturers should be able to submit a request for only a small subset of uses of a chemical – not all uses and ways in which people might be exposed. In the rule published yesterday, the EPA significantly rolled back its approach. Specifically, the EPA decided that manufacturers would no longer have to submit information on all uses, but could make a request based on only the uses “that are of interest to the manufacturer.” The EPA would still have to do a full review of the chemical, but the burden would now be completely on the agency to identify the other uses and collect the relevant information. The EPA would have to meet the same strict deadlines, but without the benefit of the screening period it has for other chemicals, meaning the evaluation is less likely to be done well. The EPA also backed down from its proposal to give preference to higher-risk requests. It will now accept manufacturer requests in the order received, likely making it easier for industry to get their favorite chemicals rubber-stamped quickly. In the proposed rule, the EPA created an information-gathering period, called “pre-prioritization,” to seek and collect data on chemicals of concern. This period was designed to ensure the EPA had enough data early on to make informed decisions within the strict statutory deadlines. The final risk evaluation rule also included new definitions and changed others at the behest of groups like the ACC. In January’s proposed rule, the EPA declined to codify definitions of several key terms like “best available science” and “weight of the evidence.” It expressed concern that doing so would “inhibit the flexibility of the agency to quickly adapt and implement changing science.” The EPA did, however, opt to include an expanded definition of a “potentially exposed or susceptible subpopulation” to make clear that it may include vulnerable populations not specifically named in the statute. EWG and other public health groups applauded this definition and considered it to be very health-protective. The two final rules published last week represent a critical early test of the strength of the new law. That the EPA was willing to so significantly weaken these rules in favor of chemical industry demands does not bode well for public health. If Dourson is confirmed, the outlook is even bleaker. Unlike the ACC, we’re not feeling optimistic at all.